Can be used to make jam, or as a topping for yogurt or ice cream. 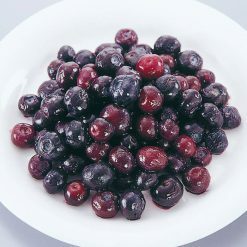 Cultivated to be large and just the right balance of sweet and sour, these blueberries come frozen and ready to be used anytime. Fresh blueberries bruise, squish, and spoil easily, but frozen blueberries are worry-free! They can be eaten all by themselves, or can be added as a pretty topping to ice cream or yogurt. Alternatively, the blueberries can be used to make homemade jam, as a component in a smoothie, or an ingredient in blueberry pancakes. They make a great natural, alternative dessert — a dessert that’s good for you! Blueberries contain anthocyanin pigments, a type of antioxidant compound which is said to be good for your eyes as well as having other health benefits. Sugarlady’s produce is harvested in season and then frozen immediately in order to ensure the highest possible nutritional value and best flavor, and remains vibrant and undamaged when frozen for long periods. Even if our blueberries remain frozen for months, once defrosted they will still have their rich, dark color. Thaw in the refrigerator and enjoy. Can be used to make jam, or as a topping for yogurt or ice cream. 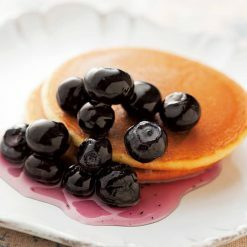 The blueberries can also be tossed in a blender with milk or a milk substitute, bananas, and other fruits to make a quick, fun-colored smoothie, or added as one of the last components to pancake or waffle batter! You can even use the juice produced by the blueberries while defrosting as natural food coloring. This product contains blueberries (America).